Detlef Schuppan has been professor for molecular and translational medicine (fibrosis and coeliac research) at Mainz University Medical Center since December 2010. From 2004 to 2010, he was lecturer, professor, and senior physician for gastroenterology and hepatology at the Beth Israel Deaconess Medical Center at Harvard Medical School. Schuppan is an international expert in the fields of fibrosis and coeliac research. Press release "Funding of DFG Collaborative Research Center developing nanomaterials for cancer immunotherapy extended"
Press release "What impact do environmental factors have on allergies?" 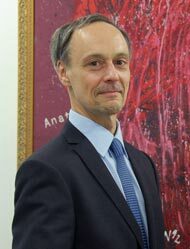 Press release "JGU obtains new Collaborative Research Center on Nanodimensional polymer therapeutics for tumor therapy"
Press release "ERC Advanced Grant for Professor Detlef Schuppan: Gastroenterologist of Mainz University receives the European Union's highest endowed research funding award"